Incident Details: Two young ladies staying at a local campsite, decided to tackle the path up the front of Barf. Having passed “The Bishop” they became cragfast at the foot of Slape Crag – a frequent sticking point for the unwary! A Team member living locally immediately set off to assist, and the Team followed with a Land Rover, three more members plus two members of Ogwen MRT who were visiting the base when the callout was received. 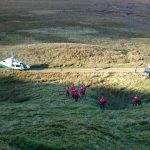 The first member to the scene calmed things down, and was able to walk the two youngsters as far as the sheepfolds, where they met up with the other Team members and they were assisted to the bottom of the crag. 6 Team members + 2 Ogwen MRT – 1 hour 34 minutes.